Woo the love of your life with elegant Valentine's Day Serenades. 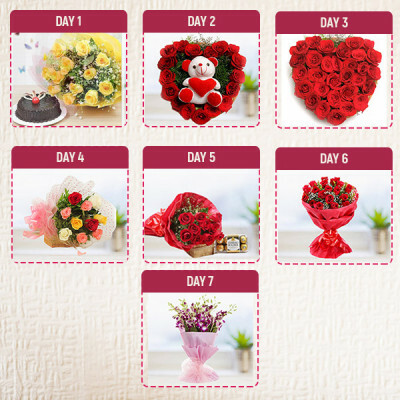 Send gifts for 2, 3, 4, 5, 6, 7, 8 days of Valentine or arrange for a professional guitarist to sing on your behalf with MyFlowerApp. Day 1 - Bunch of 6 Baby Pink Carnations in pink paper packing and pink ribbon bow, a box of 200gm Ferrero Rocher chocolates, and a 6inch teddy bear. 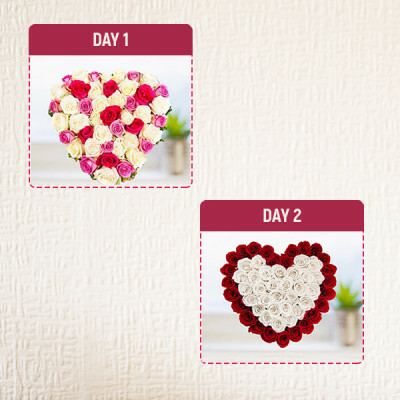 Day 3 - 3 layers made of 100 fresh and hand-picked red roses along with fresh green leaves arranged in a basket. 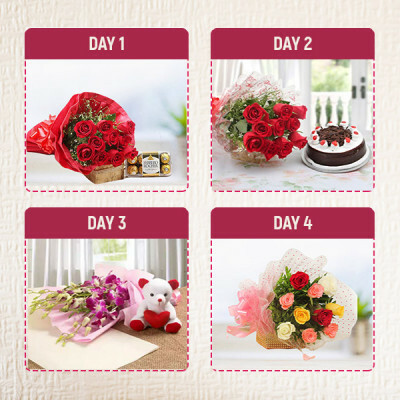 Day 2 - 15 Red Roses, 6 inches of Teddy Bear and 2 Dairymilk Silk Chocolates of 60 gm. Day 5 - 30 red Roses heart-shaped arrangement. Day 1 -12 Red Roses bunch. 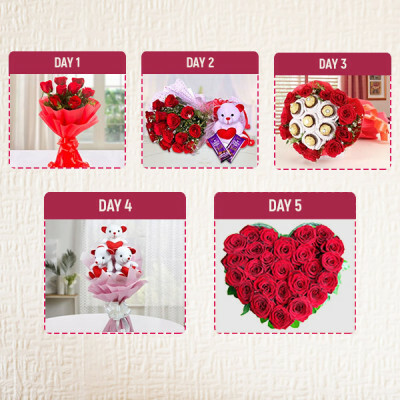 Day 2 -“I love you” flower arrangement full of hand-picked intense 50 red roses with a perfect heart made with it and a cute 6" teddy. 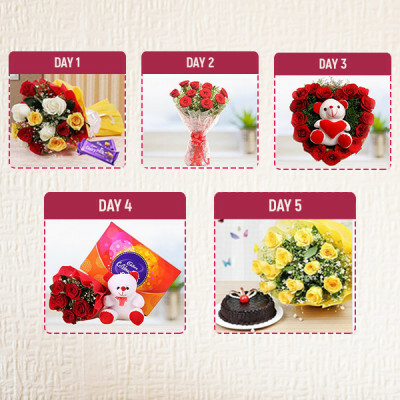 Day 6 - Basket arrangement of 12 Red roses with 2 cute soft toys, 2 yellow Asiatic lilies wrapped in yellow paper packing in a basket. Day 7 - 50 Red Roses in heart-shaped arrangement and 6" teddy. Serenading someone’s object of desire is a scene, often found in the movies, and most girls swoon over this occurrence. Let us help you recreate one such scenario for you as well. This Valentine's Day, take a leaf from your girl’s favorite romantic movie and sing to her, a song that exactly expresses your love for her. MyFlowerApp brings to you, the option of actually serenading the love of your life, with our ‘Rhythm of Flower’. You decide the setting and the song; we will provide you with a skilled guitarist, who will fill your idea with life, with his soulful singing. Even though this is something that is rarely seen in real life, due to the possibility of being embarrassed, this is still a hit amongst young couples, especially those who are planning on proposing or have a grand surprise in store for their beloved. Serenades have become quite popular, thanks to our Bollywood heroes always serenading their love interests in the movies. 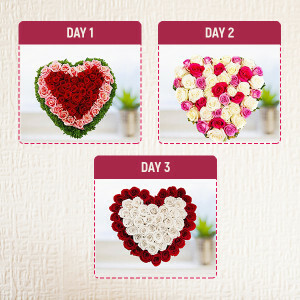 Take a step over and above this Valentine's Day 2019, and woo the love of your life and make her fall for you, once again. Instead of doing something special, only on Valentine's Day, make the whole Valentines Week special with MyFlowerApp. Send her combos of gorgeous flowers, chocolates, cakes, teddy bears, and more for however long you want. 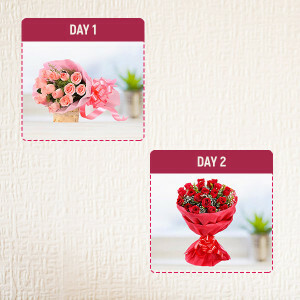 With Valentine Serenades for two to seven days, you can send your love to your girlfriend far from you, without having to worry about them every day. 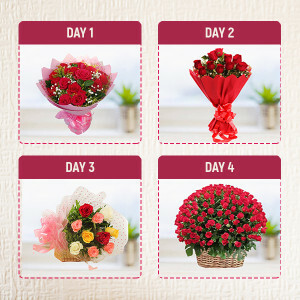 Simply select a starting date, and we deliver your love to her doorstep, each day, on time anywhere in India. Remind your wife that she is still the most beautiful woman on this planet for you, by getting these dazzling combos delivered to your place day after day of the week up until Valentine's Day, with our early morning delivery services. Valentine's Day is the day of all those who are in love. 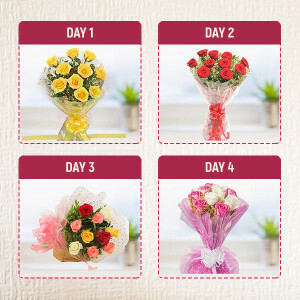 If you are trying to make this day extra special for your girlfriend, wife, boyfriend, or husband – select one of these serenading options by MyFlowerApp, and make a grand gesture, straight out of a romantic novel or the movies and leave them astounded and filled with your love.